Early this year a patient in our Panama City clinic was diagnosed with Leprosy. This is the first known diagnosis of this disease in Bay County, Florida. Although rare, there has been a spike in leprosy cases in the Southeast over the past 2 years, with cases almost tripling in Florida from 10 to 27. 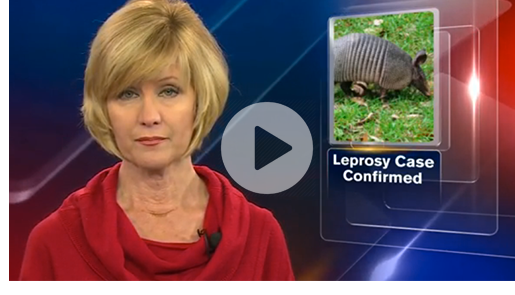 Scientists believe contact with armadillos is the reason, citing that 16.5% of armadillos tested in FL, GA, AL and MS are known to be carriers of the bacteria, Mycobacterium leprae. It is estimated that more than 100,000 armadillos are infected in the southeastern U.S. alone. Although leprosy is contagious, only 5% of the population is able to contract the disease. There is no test to determine if you are at risk. Leprosy is diagnosed through a clinical biopsy. This infectious disease has a lengthy incubation period, from 2 years to a decade. Our patient had contact with an armadillo between 5 and 7 years ago when he shot it and then handled it as he disposed of the animal. His symptoms presented as a rash on his elbows and feet that would not resolve. The treatment for leprosy is antimicrobial drug therapy, a series of common antibiotics, which must be taken for an extended period of time, 6 months to 2 years. Within a week of beginning the treatment the patient is no longer contagious. The disease presents first on the skin but, if undiagnosed and treated, can progress to cause underlying nerve damage, damage to the eyes and bones. Leprosy can be fatal if allowed to grow untreated. The primary lesson here is not to touch an armadillo or its habitat. And, if you have an unexplained rash, schedule an appointment with a dermatologist.